The inability to read Apple’s natively formatted HFS+ disks on an Android device is a rather petty issue, even as a first-world problem. But if you’re a Mac OS X Apple-ite, and a member of that rare part of the tribe that rocks an Android phone—or the more common type who owns an Android TV device—then you might find the ability to read drives formatted HFS+ to be a handy feature. After all, exFAT is slower writing small files, and NTFS write support is deliberately disabled in OS X for data safety. And HFS+ is Apple, darn it! (soon to be replaced with the APFS, but that’s another story). 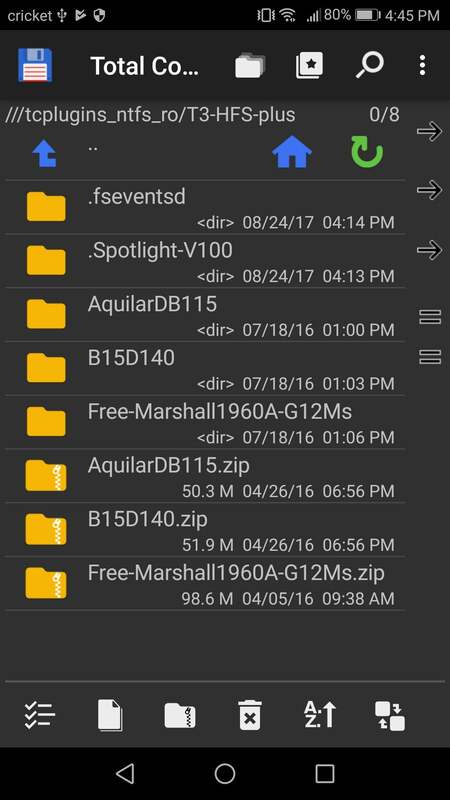 To the rescue, as it were, is Paragon with its free-ish exFAT NTFS USB Android app. That’s certainly not the most melodious of names, and it hides the fact that HFS+ support is included, but it is—albeit as an in-app purchase. Once we’d straightened that out, all that remained was to test it. Having reviewed and used Paragon’s file-compatibility products before, I was expecting PeNUA (that’s my acronym) to work. It did. Without the app installed, Total Commander on my Huawei Honor 8 phone would only read FAT and NTFS. Using the app, I was able to access all the FATs (16/32/ex), NTFS, and of course HFS+. I didn’t have a Sony TV handy, but I was assured it works. Shout at Paragon if it doesn’t. Yes, it works. This is a Samsung T3 formatted to HFS+. In case you were wondering, the files are guitar amp cabinet impulse responses. Okay, now for the joy mitigation: PeNUA is not free. It also requires installing the shareware file browser Total Commander. That’s not a bad idea anyway if you like seeing what’s stored on your device in an old-school view. You don’t want the in-app purchases for the FATs or NTFS, however; Android can already read those, though Paragon says its drivers are better. 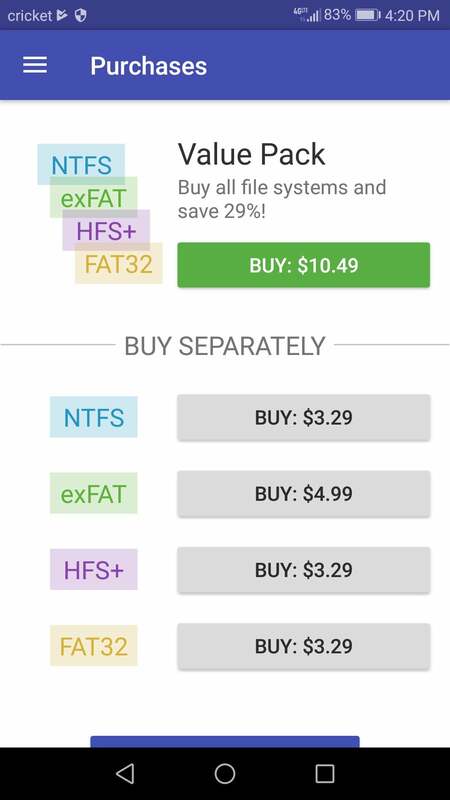 They might well be, or you might consider the company offering FAT32 support for $3.29 and exFAT support for $4.99 as a bit of a money grab. It’s certainly not if your device needs them. Most Android TVs won’t, but most Android TVs don’t support HFS+. Paragon charges $3.29 for that, which isn’t bad at all. It’s also worth noting, however, that Nvidia’s Shield Android TV offers native support for FAT32, exFAT, NTFS, and HFS+, so you probably don’t need this software for that device at all. A $3.29 in-app purchase is required enable HFS+ support. Before you install or purchase anything, make sure you really need it by trying whatever format disk you have with your TV or mobile device. I’ve never seen an Android device with HFS+ support, but read support is available under Linux (which is at the heart of Android—if you didn’t think you were a Linux user), so you never know. If you do need it, I can assure you that Paragon’s solution works. 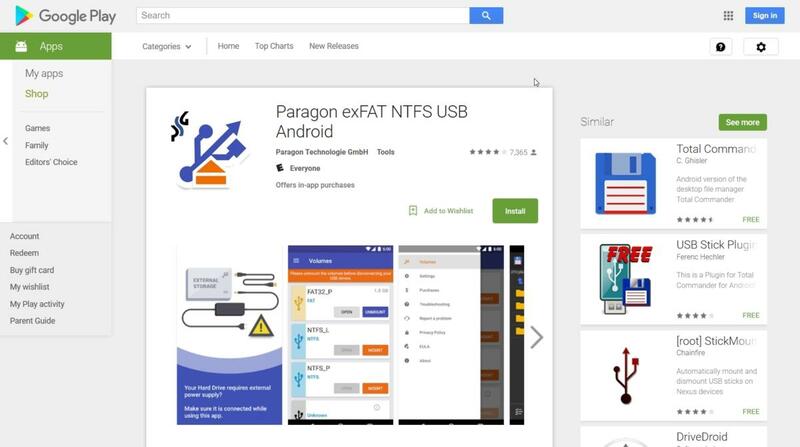 But we’re going to get geeky here for a second and tell you about another Android product from Paragon—UFSD (Universal File System Driver). UFSD is only usable if you’ve “rooted” your Android device; that is, you’ve added a Linux super-user account and given it access, so you can add and remove/use anything you want. As the equivalent of iOS’s Jailbreak, rooting allows lots of customization that’s not easy, or even possible otherwise. At any rate, UFSD will give you NTFS (if needed) and HFS+ access from within any app, not just Total Commander. For those who are not “I-am-Root” types, exFAT NTFS USB Android is a nice, if oddly named, convenience app. If you need to read HFS+ disks on your Android device, this software makes it possible.